I am FINALLY feeling like my old self again. My energy is high. I don’t wake up feeling hungover. I am getting things done again. I do hit a wall around 5:00 PM and need to rest and I do fall asleep early around 8:30 or 9:00 but otherwise I feel absolutely great and ready to continue my battle with all of the intensity required. THAT is the kind of intensity needed to fight Cancer! Today Helene and I are going to Philadelphia for a second visit with University of Pennsylvania to sign consent forms for their trial. I am very excited about this one. I don’t want to share details until all the consent forms are signed and we are in. I am a little superstitious that way but it looks like there IS a road to remission. Look out Cancer. 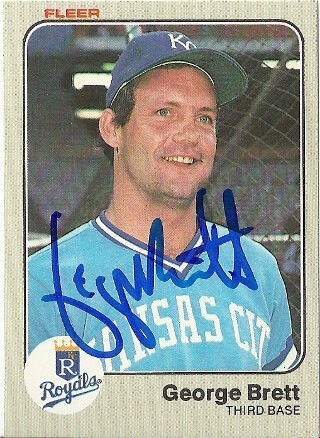 George Brett is now on my side! Great to hear Brad! Keeep Going. Dear Brad, Welcome back! Can just hear your voice in your written words. Good luck at Penn. A great hospital – my brother, Charlie (who was Herman them) trained there. Hugs, Uncle Herb and Aunt Roberta. P.S. Wish I knew more about baseball idols. Only remember Sandy Kolfax and a few others. A cousin, a wild baseball fan, gave his son the middle name of “Kolfax!” Is that going too far? Glad you’re feeling back to your old self. Keep up that Bradtensity and good luck in Philly. So glad you are back in the track. I am sure Brett can learn for you. Go Brad!! Glad to hear you are feeling stronger! Good luck in Philly today!